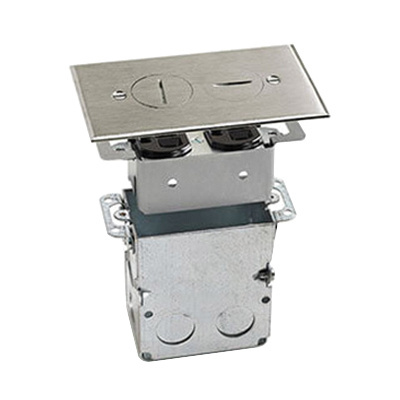 Lew 1-Gang 1/8-Inch recessed floor plate in nickel silver finish, comes with 3-Inch x 2-Inch x 3.5-Inch back box and 4-5/8-Inch x 2-7/8-Inch cover. It has a maximum capacity of 18-Cubic-Inch. This rectangular floor plate features 1/2-Inch knockout. It comes with one duplex 15-Amp tamper-proof configuration. This floor plate is suitable for versatile power or communications applications. It supports recessed mounting. Floor plate is UL listed.